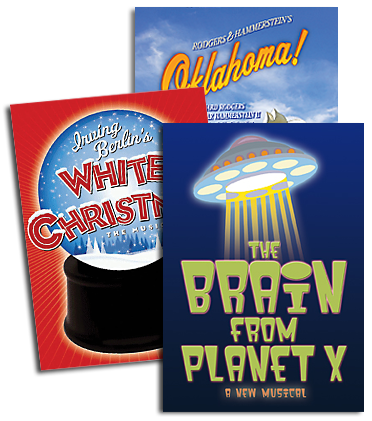 The upcoming Broadway production of IRVING BERLIN’S WHITE CHRISTMAS is pleased to announce that Stephen Bogardus, Kerry O’Malley, Jeffry Denman, Meredith Patterson, Charles Dean and Susan Mansur will lead a cast of 33 in the highly anticipated holiday engagement. Irving Belin's WHITE CHRISTMAS tells the story of two showbiz buddies, Bob Wallace (Bogardus) and Phil Davis (Denman), who put on a show in a picturesque Vermont inn owned by General Waverly (Dean) and run by Martha Watson (Mansur). The showbiz team attempt to save the inn from closing and find their perfect mates in the bargain—sister act Betty and Judy Haynes (O’Malley and Patterson). Full of dancing, laughter and some of the greatest songs ever written, the musical promises to be a merry and bright theatrical experience for the entire family. 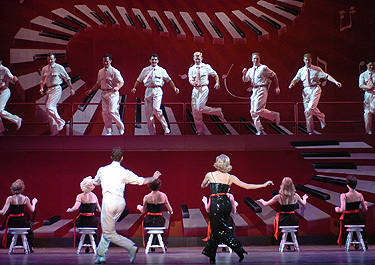 Denman, Patterson, Dean and Mansur originated their roles in the 2004 San Francisco world premiere of IRVING BERLIN’S WHITE CHRISTMAS. Bogardus and O’Malley starred opposite each other in the 2005 Boston and 2006 St. Paul productions. Stephen Bogardus will star as song and dance man “Bob Wallace,” the role made famous by Bing Crosby in the classic 1954 film. Broadway: LOVE! VALOUR! COMPASSION! (Tony Award® nominee), OLD ACQUAINTANCE, MAN OF LA MANCHA, FALSETTOS, LES MISÉRABLES, WEST SIDE STORY. Jeffry Denman will play Mr. Bogardus’s army buddy, the charismatic ladies’ man “Phil Davis.” Broadway: THE PRODUCERS, the final company of CATS, the revival ofHOW TO SUCCEED IN BUSINESS WITHOUT REALLY TRYINGand DREAM. He choreographed the long running Off-Broadway hit NAKED BOYS SINGING! Meredith Patterson will play Betty’s younger sister “Judy Haynes.” Broadway: 42nd STREET (Peggy Sawyer), Julie Taymor’s THE GREEN BIRD; and City Center Encores!, in Irving Berlin’s FACE THE MUSIC. Charles Dean will play “General Waverly,” Bob and Phil’s former commanding officer and proprietor of the Vermont inn. Broadway debut. Company member and associate artist for 20 years at the Tony Award® winning Berkeley Repertory Theatre. Susan Mansur will play “Martha Watson,” General Waverly’s right-hand woman, a role she has returned to for the last four holiday seasons after originating in San Francisco. Broadway: THE BEST LITTLE WHOREHOUSE IN TEXAS (“Doatsey May” Original Cast), DAMN YANKEES(opposite Jerry Lewis). Off-Broadway: STEEL MAGNOLIAS and RUTHLESS! (Original Cast). For tickets, credits and more information on IRVING BERLIN’S WHITE CHRISTMAS, visit www.whitechristmasthemusical.com.